Why Is There An 'Nd' On The Display Panel Of The Washing Machine? 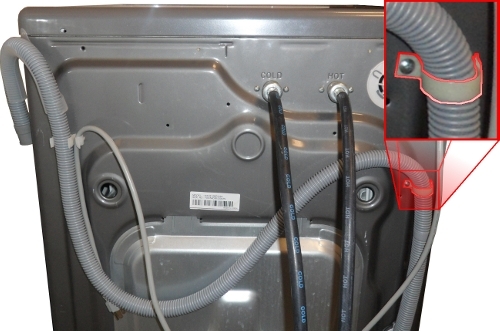 If your washer is beeping, and the display is flashing "Nd", your machine is showing a no drain condition which is usually related to a backed up drain hose or a clogged debris filter. The drain hose coming from the back of your washing machine should not be inserted more than 6 inches into the drain/stand pipe in your home. 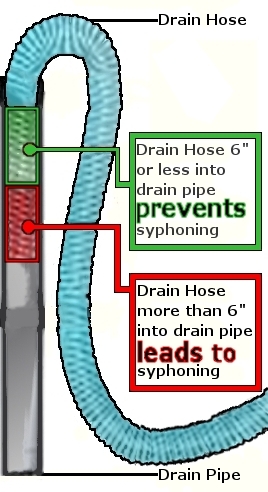 Inserting the drain hose too far into the drain may cause a syphon effect preventing any water from draining out of the washing machine. This will cause an "Nd" error. 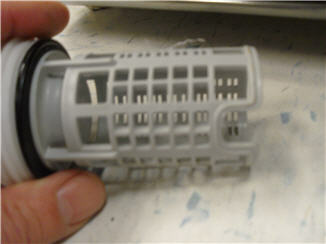 Many customers remove the drain hose fastener attached on the back of the washing machine during installation. It is a white plastic strap secured with a metal screw, approximately 18 inches above where the drain hose comes out of the washing machine. Do not remove it. It is in place to prevent syphoning. WARNING: If you were running a hot, or sanitize cycle when Nd flashed, the water in the washer may be very hot. Allow the water to cool for approximately 1 hour before performing this procedure. 1. 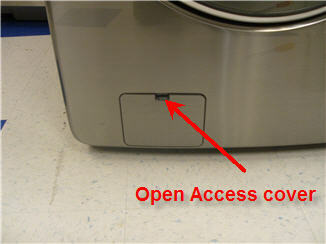 Open the debris filter access cover. 4. Place a towel on the floor to prevent water damage to the floor. 5. 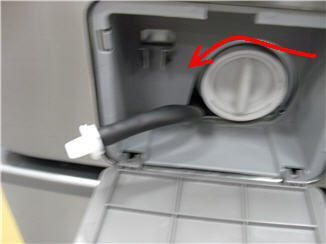 Remove the white drain plug from the drain hose, and then drain the water into a suitable container. 6. Remove the debris filter by turning it counter clockwise. 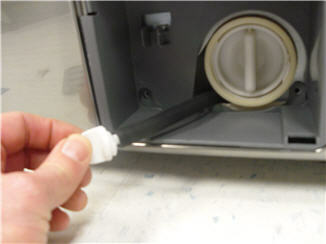 7.Clean the filter, and then reinstall the filter. 8. 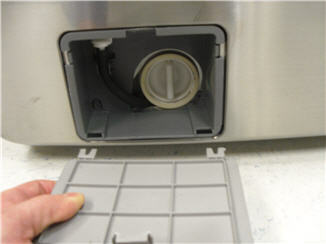 Reinstall the drain tube cap, and then secure it in its holder. 9. Reinstall the access door. 10. Check for leaks as the washer is filling up.